When a job out in the field needs to be done in any type of weather or conditions, and tractors or traditional ATVs will simply not accomplish the tasks at hand; perhaps consider the new Argo Avenger 750HDi 8WD utility terrain vehicle (UTV) from Argo ATV . The 2010 ARGO 750HDi 8WD UTV is the farmer’s or property manager’s dream come true. With it's off-road versatility and cost-effectiveness it is the ideal workhorse for light duty applications, particularly in agriculture and forestry. This new top of the line Argo UTV model features enhanced performance and handling, improved fit and finish, as well as reduced maintenance time and cost. Driven by a powerful 31hp 748cc electronic fuel-injected Kohler LH 775 engine, the 2010 ARGO 750HDi 8WD UTV is just what many Argo users in commercial applications have been waiting for. 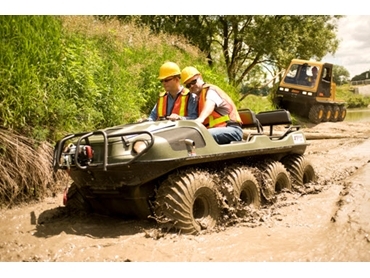 This utility terrain vehicle comes with the new Argo designed and patented ‘Admiral’ transmission, up to 50% more efficient than hydrostatic drive systems and 20% more efficient than the current ARGO transmissions. The result is a very smooth ride when operating on trails in high range, and easy turning within its own length in low gear. When in water, these innovative tyres propel the UTV with great floatation and stability. sealed beam headlight and convenient accessory switches that are easy to use even when wearing work gear. The 2010 ARGO 750 HDi 8WD UTV's engine has a low emission rate which meets both EPA and CARB standards. Its technological advances include an effective throttle response for smooth acceleration, even better fuel economy, reliable cold weather starting, and excellent performance in high altitudes. Also available from Argo ATV for 2010 are the smaller, but still powerful ARGO 6x6 Frontier 580 and 650 model, the ARGO 8x8 Frontier 650 as well as, the ARGO 8x8 Avenger 700 and 750 EFI. These vehicles are ideal for the off-road enthusiast who would like to experience an alternative to the top-of-the-line model. The Argo product line is designed for commercial use, including utility construction and maintenance, resource exploration, agriculture, forestry, as well as firefighting and search and rescue operations. These versatile all-season workhorses can also be adapted to suit a wide range of custom applications using the extensive line of accessories including tracks, convertible top, winch, ROPS and many more.